Upcoming Events of interest for improvisers and actors. "Make it up! Beat it out! REPEAT!!" In a nutshell... two amazing performers from Los Angeles are coming down Memorial Day weekend to do an extensive 4-hour master workshop on turning Improv to Sketch. If you've ever found yourself thinking that the ideas you come up with in rehearsals and shows should be farmed for sketch, this workshop will give you the techniques and motivation to do so! Some of the most original comedy sketches have been born out of the randomness of improvisation. Many sketch teams (and one of North America's biggest comedy institutions) use improv and the power of "Yes And" as a spring board for unique, absurd, and hilarious ideas. Now it's your turn! Spaces are limited, so sign up today! Workshop will take place in a Miami-Wynwood Studio - address sent upon registration. In this four (4) hour Master Workshop, you will learn how easy it is to utilize improvisation to write fun, funny, and fresh sketches! 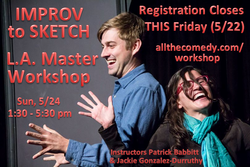 In this four (4) hour master workshop, Los Angeles Improvisers and UCB, Second City, and iO West performers Patrick Babbitt and Jackie Durruthy will teach you new improv techniques that will put you in the best spot to start writing, as they work on simplifying your scene work and locating the "joke" or "game" of the scene. They'll also teach you different ways to expand upon the game and how to beat it out, writers-table style! After this extended workshop you will look at sketch writing in a new light. You'll accept your ideas, ditch your self judgement, and get to work! You will also learn how to create characters and bring them into the improv universe. Armed with the skill of writing through improv you'll be able to rewrite your old sketches and keep your new ones fresh! This workshop has been taught in Los Angeles, Chicago, San Fransisco, and Hawaii! Make sure to check out its Florida debut!! Patrick Babbitt and Jackie Gonzalez-Durruthy are improvisers and actors working in Los Angeles. They began performing at Improv Olympic and Second City in Chicago, where Pat attended the Theatre School at DePaul University and Jackie attended Columbia College. They both moved to L.A. and have been performing regularly at UCB, Second City, and iO West Theaters for the past 4 years. Pat and Jackie are currently on House Harold teams at iO West. You can catch Pat in a few episodes of Community on NBC, and you can hear Jackie's voice along side Nathan Fillion's and Scarlett Johansson's in Assassin Banana. They both love ice cream and high fives. "Make it up! Beat it out! Repeat!" Wanna do musical improv at MicroTheater Miami? Guest spots available on Wednesdays! E-mail or text me with your open Wednesdays. For those of you who don't know, one of my hats is the new Improvisation Coordinator for MicroTheater Miami. I help them program their DYNAMIC Wednesday Nights of improvisation; the first improv series they've ever hosted. One of the perks is in addition to booking some talented local teams, I get to run my own space. So I created a show that is made up entirely of guest players. If you'd like to try your hand in the unique world of MicroTheater Miami, want to jam with improvisers from other teams, AND wanna try some simply musical improv to boot, let me know & I'll try to find a spot for you. MicroTheater Miami allows for six (6) 15 minute shows, starting every 30 minutes between 8pm and 11pm. 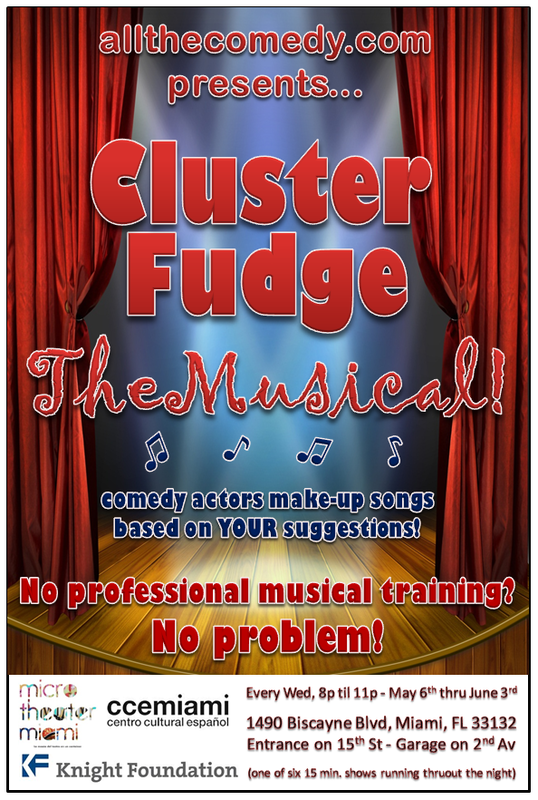 "ClusterFudge: The Musical!" is a completely improvised musical improv show where a three to four person crew will do a montage of scenes where, at any time, the Tech person will play one of 20 random genres of music. We do practice scenes the hour leading up to the first show, then just go! Each cast member will take at least one turn running "Tech" (an easy job where you randomly play one of 20 different genres of music off a laptop whenever the scene calls for it). Participants MAY even get to catch one or two of the other DYNAMIC Wednesday shows during off time. ClusterFudge is my pet project that allows for players from different teams to mingle and perform with one another. If you're interested in the above, e-mail or text me! We'd love to have you!